In a poll that included twenty of the most popular prepaid cards on the market, Green Dot came out on top according to Card Hub as part of its 2012 Prepaid Cards Report. The Green Dot Gold prepaid Visa was chosen by Card Hub as the best checking account alternative because of its “fee structure and large number of in-network ATMs” that make it easy for users to avoid a lot of the fees many prepaid cards have tacked on. Other features cited by Card Hub include direct deposit, online bill pay and a $10,000 balance limit. 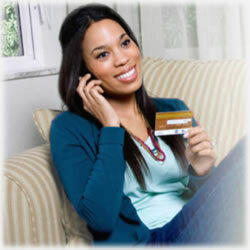 The Green Dot prepaid products are the right solution for a growing number of Americans. The absence of interest charges and lower fees are just part of the reason it’s ranked number one. Issued by Synovus Bank, it’s easy to obtain these prepaid cards. A $9.95 application fee that’s deducted once funds are loaded and a $4.95 monthly maintenance fee as well as a $4.95 loading fee are the most common charges customers see. With more than $57 billion loaded onto prepaid cards in 2011 alone, there’s no doubt this is a growing industry; in fact, between 2010 and 2011, the market grew by nearly 33%. By the time 2012 comes to an end, that number will likely rise by 44% to $82 billion. This, according to the Mercator Advisory Group, says consumers will load around $117 billion onto prepaid cards – a full 200% usage increase in just three years. While many question the motives of some celebrities, there’s no denying the growing number who are getting in on the prepaid market. Most recently, Magic Johnson announced his Magic MasterCard and Suze Orman released hers earlier in 2012. This is a testament to the investment that issuers are making in the prepaid card sector. Applicants are guaranteed approval with no credit or employment verification and a bank account is not required to qualify. These have grown in popularity for these reasons. More Americans are struggling to regain a sterling credit rating and as a result, they’re turning to these solutions to serve their purposes in the meantime. Our customers consistently tell us how our product has helped them control spending and manage their finances. We’re pleased that our prepaid debit card has been independently recognized by Card Hub as the best checking account alternative. With more than 20,000 in-network ATMs around the country, it’s little wonder more folks are reaching for this prepaid debit card. So what do the millions of consumers believe? Many have cited in the past it’s the simple fee structure that keeps them coming back. “Any opportunity to bypass a fee is one I’m more than happy to take, especially considering how many ATM withdrawals I have each month”, said one Green Dot customer. In fact, this particular customer easily makes thirty transactions in a month, which qualifies him to bypass all the fees. The free direct deposit feature is a great bonus, too, say customers. As mentioned, the report took an in-depth look at twenty of the most popular prepaid cards on the market. It considered fee structures, versatility in how well it works for the entire family, including teens, and how it serves the purpose of those looking for an “alternative check cashing tool”. The AccountNow Visa Classic didn’t fare so well in this survey; in fact, it was named “Worst Card for Alternative Checking Account”. Reasons cited include a $2.50 ATM withdrawal fee and a $1 fee assessed every time the card is used for purchases, which could make it a very costly choice. without a doubt the least expensive option when used as an alternative check cashing tool. Rather than pay to cash checks and load funds via MoneyPak, Chase Liquid cardholders can do both for free at Chase Bank branches. They can also withdraw cash for free from Chase ATMs. Green Dot is a publicly traded (NYSE:GDOT) bank holding company regulated by the Board of Governors of the Federal Reserve System. The Company provides widely distributed, low-cost banking and payment solutions to a broad base of U.S. consumers. Green Dot’s products and services include its market leading category of General Purpose Reloadable (GPR) prepaid cards and its industry-leading cash transfer network which are available directly to consumers online and through a network of approximately 60,000 retail stores nationwide where 95% of Americans shop. Green Dot is headquartered in the greater Los Angeles area.